Quantum channel identification is the metrological determination of one or more parameters of a quantum channel. This is accomplished by passing probes in prepared states through the channel and then statistically estimating the parameter(s) from the measured channel outputs. In quantum channel identification, the channel parameters’ quantum Fisher information is a means to assess and compare different probing schemes. We use quantum Fisher information to study a probing scheme in which the channel is put in indefinite causal order (ICO) with copies of itself, focusing our investigation on probing the qudit (d-dimensional) depolarizing channel to estimate its state preservation probability. This ICO arrangement is one in which both the eigenvectors and eigenvalues of the channel output depend on the channel’s state preservation probability. 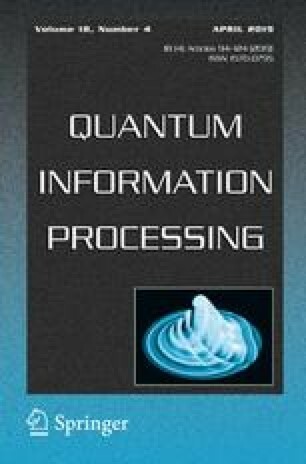 We overcome this complication to obtain the quantum Fisher information in analytical form. This result shows that ICO-assisted probing yields greater information than does the comparable probe re-circulation scheme with definite causal order, that the information gained is greater when the channel ordering is more indefinite, and that the information gained is greatest when the channel ordering is maximally indefinite. This leads us to conclude that ICO is acting here in a strong sense as an aid to channel probing. The effectiveness of ICO for probing the depolarizing channel decreases with probe dimension, being most effective for qubits. Official contribution of the National Institute of Standards and Technology; not subject to copyright in the United States. from which inquality (50) follows.